Notes: I’ve been finding myself carrying less and less fountain pens lately. Like last time I posted my own loadout, I think there are clear favorites emerging. I’m actually really happy with everything here. The Karas Kustoms Ink is a total beast, that writes so smooth. It’s loaded with one of my favorite dark blue inks, Noodler’s Bad Blue Heron. I don’t carry this pen in a case because, well, it’s not necessary. 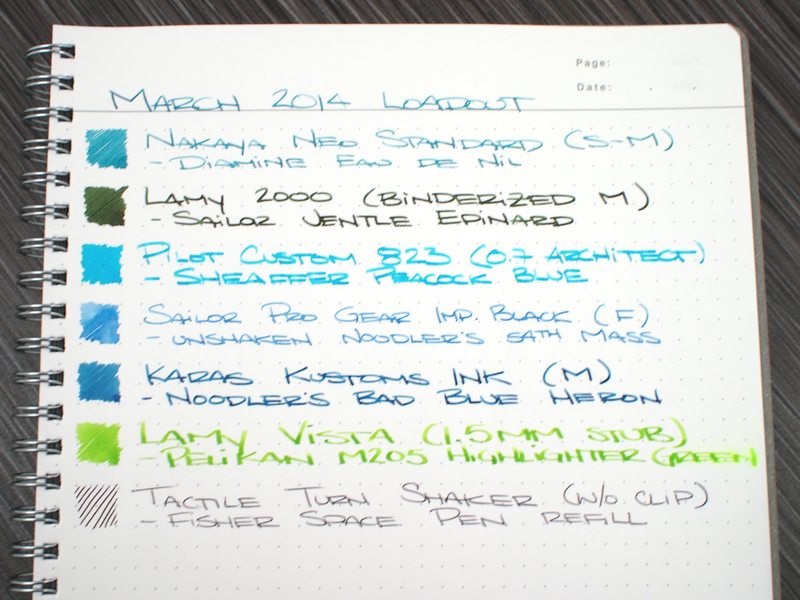 I ordered a sample of Pelikan Highlighter Green and it immediately went into the Lamy Vista. They just look so awesome together. The 1.5mm stub makes it easier to highlight things, instead of doing a bunch more passes with a broad nib. The Nakaya Neo Standard has been awesome. I’ll be posting a review of it very, very soon. I just swapped the ink from Kon-Peki to Diamine Eau de Nil and it both writes and shades wonderfully. The next pen in line is my newest acquisition, the Pilot Custom 823 vacuum filler with a custom ground 0.7mm Hebrew/Arabic/Architect italic nib. 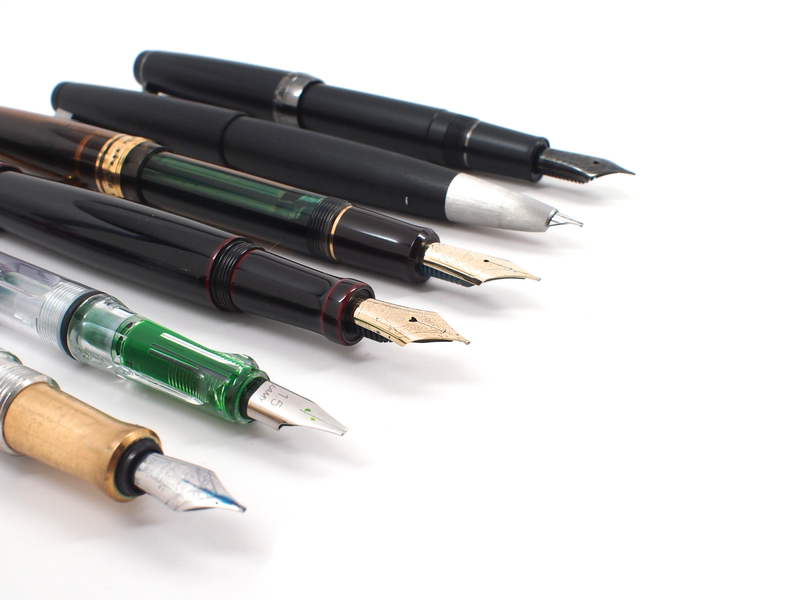 It’s super awesome, you can hear me blabbing on and on about it on the Pen Addict podcast. I always have my trusty Lamy 2000 inked up, this time with Sailor Jentle Epinard. It’s an awesome dark green with some nice shading and a subtle golden sheen. The combo is awesome. 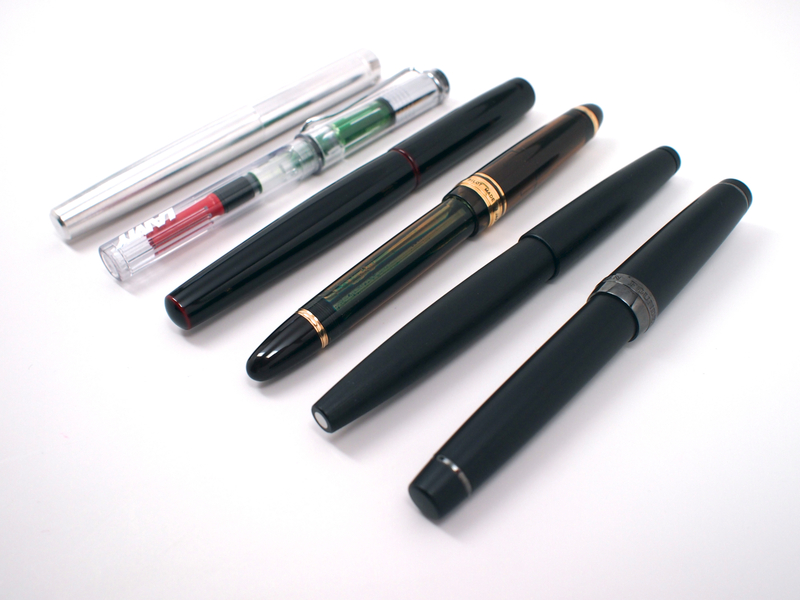 Last, but not least in the line is the Sailor Professional Gear Imperial Black which I recently had adjusted by Richard Binder at the Long Island pen show. I filled the pen up with Noodler’s 54th Massachusetts, but I didn’t shake the bottle first. What filled the pen is this weird, light blue, super liquidy fluid that doesn’t write well. It’s going to get cleaned out ASAP. I know there are mixed opinions on shaking ink bottles before filling, but I think this is a clear cut case of why it can be absolutely necessary. Three of the pens are kept safe in my Nock Co. Lookout prototype, which I’ve been using every day since Brad and Jeffrey sent me one. I’m anxiously awaiting my Kickstarter reward’s arrival, and this is doing a great job of holding me over. 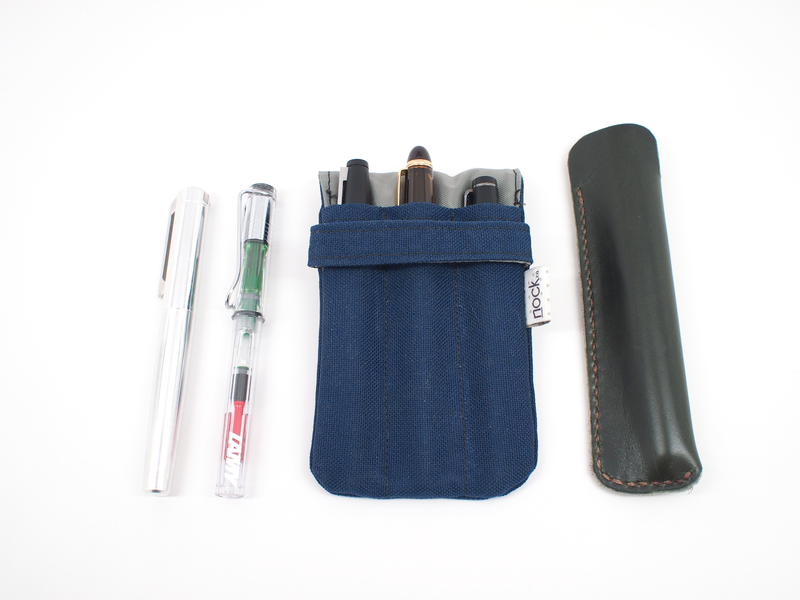 The Nakaya has been carried exclusively in a One Star Leather pen sleeve in forest green leather, that is super soft and gentle to the finish on the inside. It’s an awesomely constructed case that’s doing its job quite well. Admittedly, there’s a Tactile Turn Shaker on the list up there, but I forgot to take it out of my pocket for the pictures. This is kind of a good thing though. The pen is small enough to go unnoticed in my pocket, and I literally forget about it until I need it. It has a Fisher Space Pen refill in it, which can pretty much handle any writing task at hand. 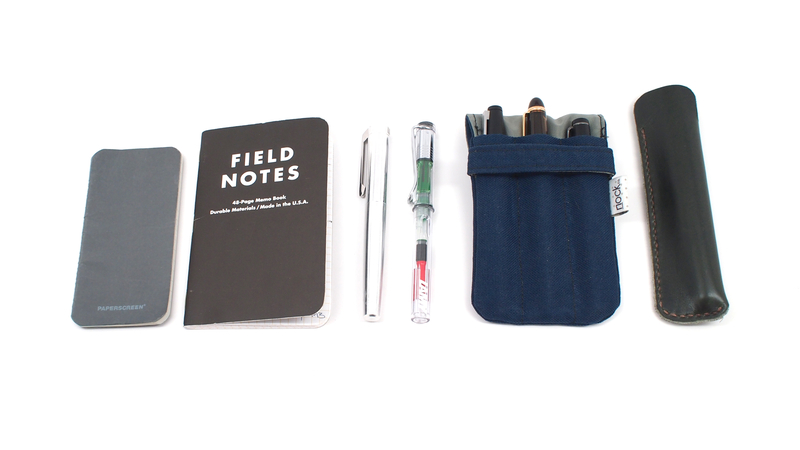 I’ve also been carrying a Paperscreen “Five” notebook in my pocket everyday for writing down odds and ends. It’s the same size as my iPhone, and they’re often in the same pocket. You can check out my full review here. I keep a Field Notes for a daily journal, and I opted to use another one from the Drink Local Colors edition. I’m really happy with the way everything is working out, with the exception of the Noodler’s dilemma. I think it’s going to be tough to change out the pens I’ve been carrying, as I like these so much. Thanks for reading! Check out my submission to ILaikePens.com for last month’s loadout to see how it’s evolved! If you need a daily dose of fountain pen pictures, check out my Instagram.  Ed, I love going through your site and check it out daily. The photography work is excellent!! I was wondering if you might share the cameras and lenses you are using? I use an Olympus PEN E-P3 camera with an M. Zuiko 17mm f/1.8 prime lens. All photos are processed using Aperture 3. The white background shots are on a MyStudio MS32 5000k lighting/backdrop setup. Any questions, feel free to ask! 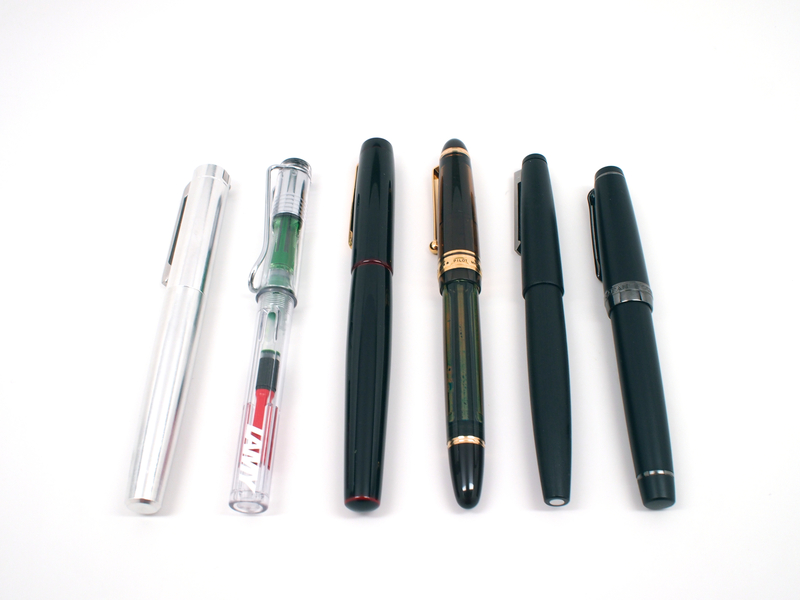 your pens are beautiful, you have a great selection. The one thing that did not make me buy the 823 was that I could not imagine how the color inks will look through the brown transparent barrel. How do you think they look? Thank you! They have a smoke colored 823 that was not sold on the US market, which I would have much preferred. Right now I have a turquoise ink in there that doesn’t look so great. I imagine grey, black, or brown would all look great though. Thanks Ed for the share. I get the impression the total investment of your EDC has grown substantially in the past 6 months! It’s slightlyyyyyyy more than it’s been in the past, yes, haha. I don’t let them leave my reach.